Power Machinery in Ventura County and Kern County is a top source for Golf Carts for industrial and commercial uses. Power Machinery is an Authorized Dealer for Club Car. Club Car is one of the nation’s top manufacturers of high quality Golf and Industrial carts. 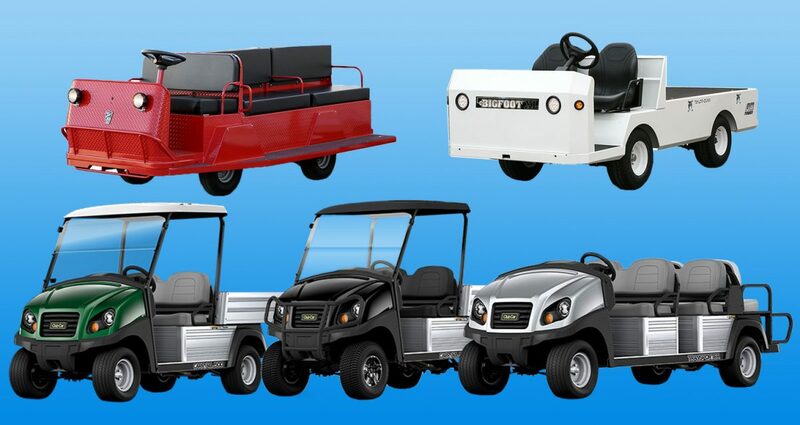 Club Car’s commitment to excellence for over 50 years enables them to produce carts and cars that are dependable, affordable and provide top performance. Based in Augusta, Georgia, Club Car is part of Ingersoll Rand. To learn more about Club Car Golf Carts and Industrial Carts, click the button below. Power Machinery is an Authorized Dealer for Taylor-Dunn Commercial and Industrial Vehicles. Taylor-Dunn shipped their first vehicle in 1949. Today they have a singular goal: to build tough, rugged, dependable vehicles to move personnel, equipment, and materials. Their guiding principle is to provide application-specific solutions, which are reliable, efficient, and economical. To learn more about Taylor-Dunn Commercial & Industrial Carts, click the button below.